Almost two and a half years of conflict have driven 3.3 million Yemenis into internal displacement, 20% of whom reside in collective centres or spontaneous settings, such as schools, public and abandoned buildings, makeshift shelters or in open areas with little to no protection. With the beginning of the new school year, many students could not continue going to school. Some schools have been turned into shelters for Internally Displaced People, others have been converted into military barracks and weapon stores. Hesn Al Daimah School is one of many that host displaced families fleeing the conflict and seeking refuge. Om Mishaal’s family is one of eight who remain in this school. After their home was demolished by the fighting, the family refused to leave because there is nowhere else to go but the streets. Children as young as nine are recruited to partake in the conflict. “If my life circumstances were better, I would have been able to pursue my education and I would always get the best grades,” says one of the recruited children. 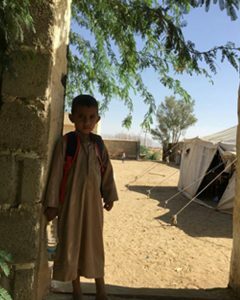 Mohammed, like many other children in Al Jawf governorate, could not continue to study in his school building because it was occupied by IDPs. Those children who have the opportunity to study are usually forced to fit in a tent that barely fits 10 people, or sit under the raging sun in open spaces. “I wish I could go back to my home and my school and study in a classroom. The tent is a very bad place to study,” says Mohammed.